This lacey summer dress will fit a toddler to young child. 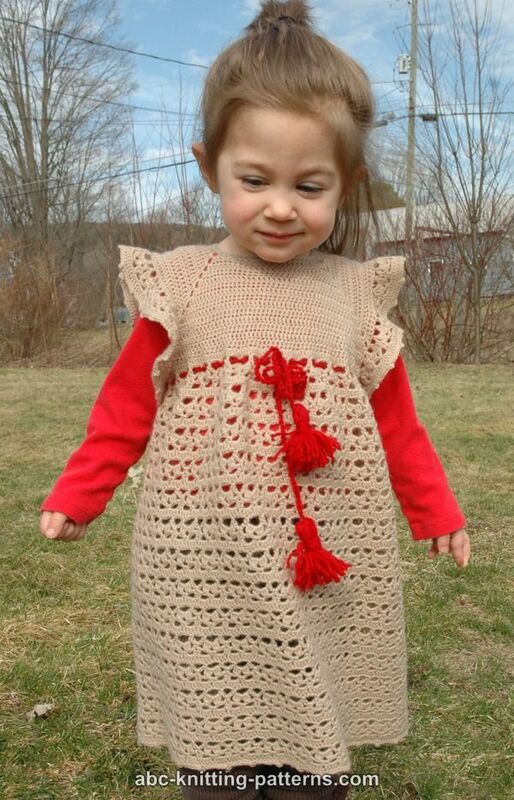 It would work well as a flower girl dress if you pick the appropriate colors. I chose a more casual color scheme. 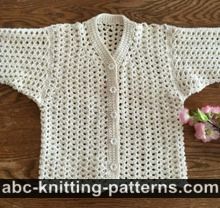 The yoke is made using basic double-crochet stitches to form a raglan top. 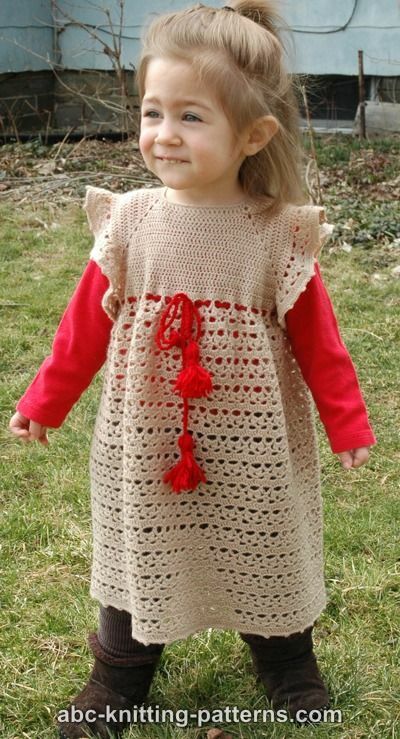 The skirt and frilly sleeves use the same lace pattern. 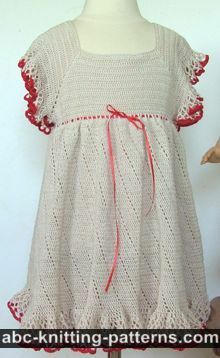 Dress features a back closure. 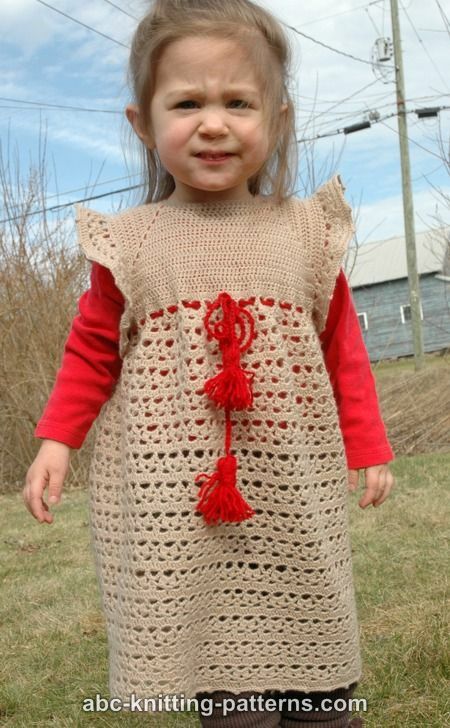 The dress is worked from the top down in rows, then in rounds. 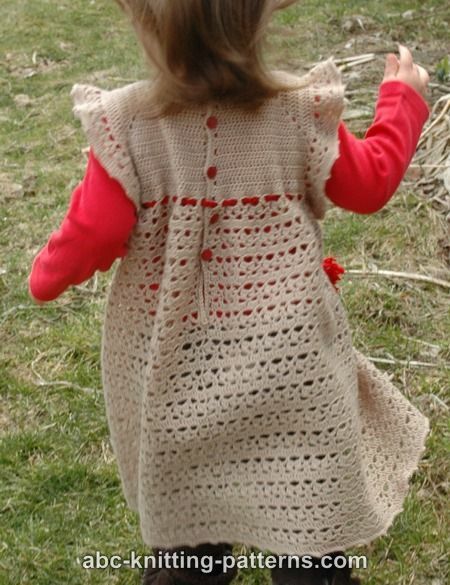 It starts from the yoke with raglan shaping and the back closure, worked in double crochet. 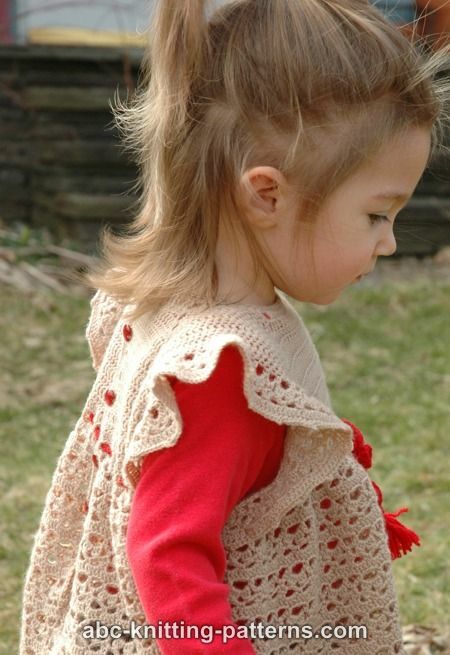 The skirt is worked in the lace pattern, first in rows for the back closure, then in rounds. 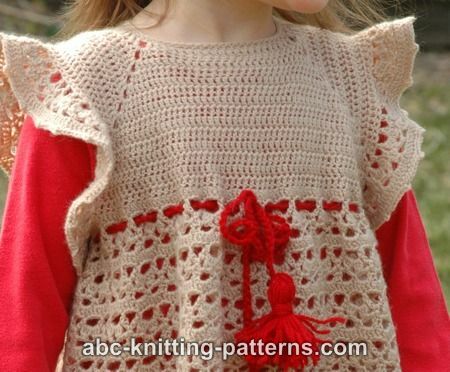 The armholes are finished with ruffles, worked in the lace pattern. Row 1: ch 3 (counts as 1 dc), 1 dc in each of next 10 (11, 11) dc (right back), ch 2, 1 dc in each of next 7 (8, 8) dc (right sleeve), ch 2, 1 dc in each of next 21 (23, 23) dc (front), ch 2, 1 dc in each of next 7 (8, 8) dc (left sleeve), ch 2, 1 dc in each of next 11 (12, 12) dc (left back). Row 2: ch 3 (counts as 1 dc), *1 dc in each next dc to ch-2, (2dc, ch 2, 2 dc) in ch-2, repeat from * 3 more times, 1 dc in each of next dc to the end of the row. Repeat Row Two 8 (10, 12) more times. Total 10 (12, 13) rows. Next row: Ch 3 (counts as 1 dc), 1 dc in each of the next dc to the next ch-2. Turn. There are no increases in this row. Repeat this row 5 more times. Don’t cut the yarn. Set aside the right back. 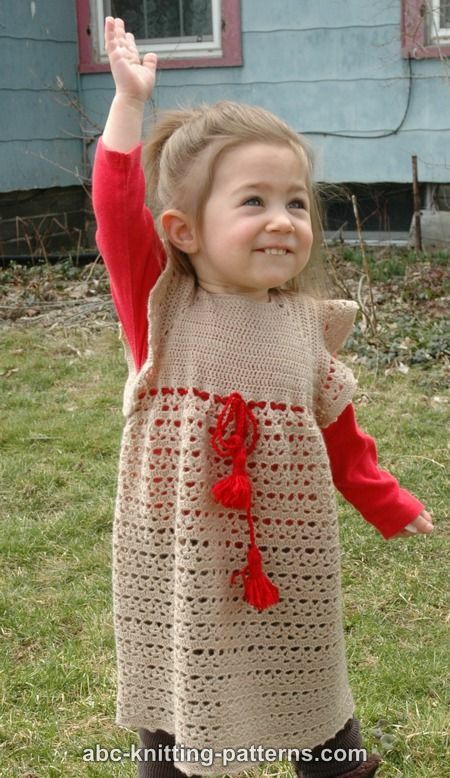 Attach yarn form another ball of yarn to the right edge of the front, to the 1st dc. Ch 3 (counts as 1 dc), 1 dc in each of the next dc to next ch-2. Turn. There are no increases in this row. Repeat this row 3 more times. At the end of the last row, ch 14. Slip st to ch-3 of the last row of the right back. Cut the yarn. 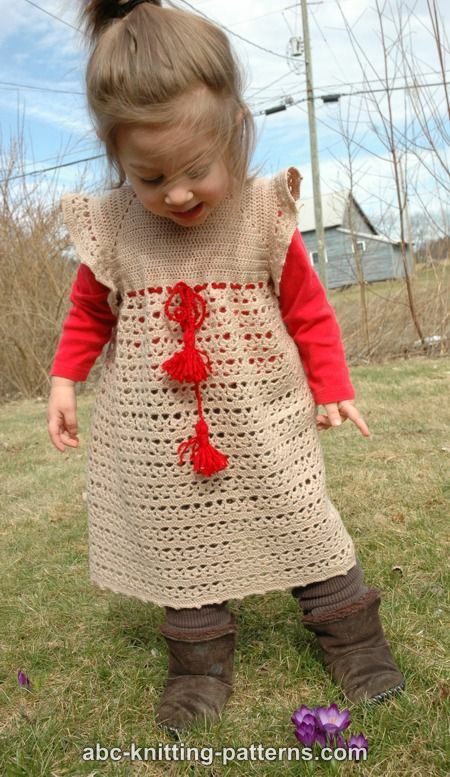 Attach yarn from another ball of yarn to the outer edge of the left back, to the 1st dc after the ch-2. Ch 3 (counts as 1 dc), 1 dc in each of the next dc to the end of the row. Turn. There are no increases in this row. Repeat this row 5 more times. At the end of the last row, ch 14. Slip st to ch-3 of the last row of the front. Cut the yarn. Ch 3 (counts as 1 dc), *2 dc into next dc (or chain), 1 dc into next dc (or chain), from * repeat to the end of the row. 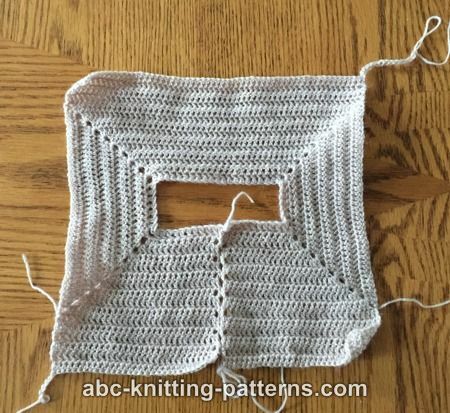 This is the 1st (or foundation) row of the lace pattern. The established increases will bring your total to 214 (244, 256). However, the total amount of sts should be 217 (241, 257). To achieve this you should increase by 3 additional sts for size 2, skip 2 increases for size 4 and increase by 1 additional st for size 6. Work rows 2-4 of the lace pattern. ch 3 (counts as 1 dc), *4 dc in next ch-3, 1 dc into the top of the next 2dccl, 4 dc into next ch-3, 1 dc into next sc, repeat from * to the end of the row, end with 4 dc into next ch-3, 1 dc into ch-3. This is the 2nd increase row. The established increases will bring your total to 271 (301, 321). However, there should be 273 (305, 321) sts. To achieve this you should work 5 dc instead of 4 in ch-3 twice for size 2 and 4 times for size 4. Size 6 doesn’t require adjustment. 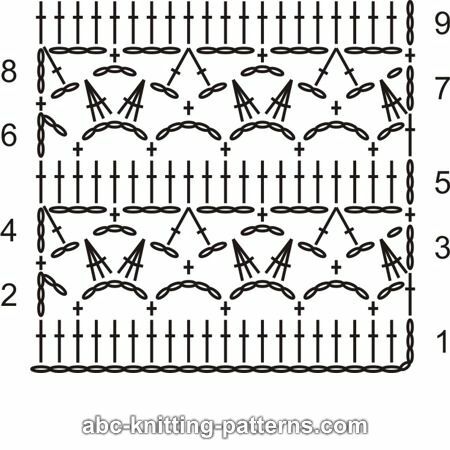 Continue to work lace pattern by repeating rows 2-5, back and forth, 3 more times. In the last row of the last repeat connect the last dc to the ch-3 of the same row and continue to work in the row. 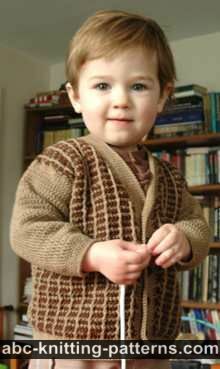 However, you have to turn your work after each round to ensure that the pattern looks the same. Work 9 (10, 12) more repeats for the skirt or to desired length. Work the last round as follows: ch 1 (counts as 1 sc), *1 sc into next 7 dc, ch 3 pico, from * repeat to the end of the round, sl st to ch-1. Tie off. ch 5, skip 1, 1 sc into next dc, *ch 5, skip 1 dc, 1 sc into next dc, repeat from * to last 2 sts (1 dc and ch 3), end with ch 2, skip 1 dc, 1 dc into ch-3. 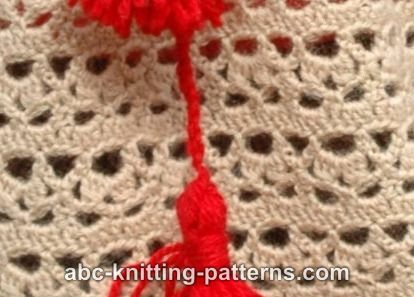 Work rows 3-5 of the lace pattern as established. Last row: ch 1 (counts as 1 sc), *1 sc into next 7 dc, ch 3 pico, from * repeat to the end of the round, sl st to ch-1. Tie off. Neckline finish and button holes: starting from the back opening work sc along the back opening of the left back, along the neckline and along the center of the right back. Make 5 button holes, while working along the right back center as follows: 1 sc, *ch 3, skip 3, 8 sc, repeat from * 4 more times, work sc to the end of the right back opening. Work another row of sc, working 3 sc into the ch-3. Tie off. Sew on 5 small buttons. Block. Crochet chain 50“ (125 cm) long. Thread it through the second skirt row. Make 2 small tassels, sew them to the ends of the chain.